Furniture painting that is. Wall colors are being chosen too, but I'm not ready to get to that quite yet. 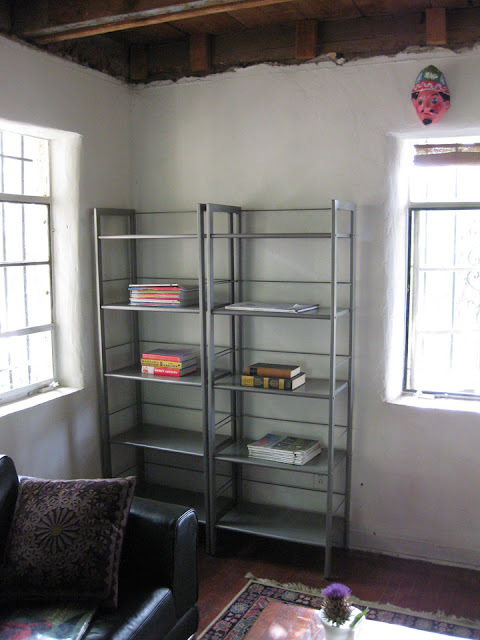 These shelves came out of my office during the Great Office Clean-out of 2009. They were over-stuffed with books and their silvery grey psuedo-industrial thing just wasn't doing it for me anymore. Off they went into my mom's storage room for a year, where they gathered dust and overflow books from her own over-stuffed bookshelves. Then the other day I decided that they might be a perfect filler solution for an awkward corner in her living room. The silver color doesn't really work in there either, so I'm going to paint them white. (Disclaimer, in case I haven't made this perfectly clear in previous posts, those purple-ish floors are due to a previous owner thinking that they could refinish the floors themselves. I think they were going for a cherry wood stain? Which they applied erratically, so its actually streaky in spots. So so ugly, but having ceiling repairs, windows replacement, and sub-floor issues to deal with first, we are not refinishing the wood floors until a later date. Even though they are awful, terrible, horrible no good floors as they stand. BIG sigh). 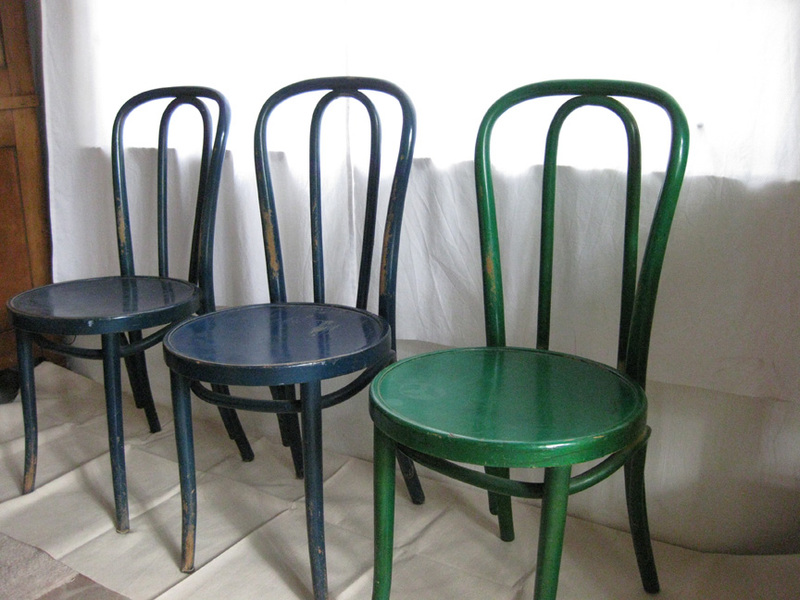 My mom once bought five of these genuine Thonet chairs at a University of MN inventory sale. There is a yellow one and another green chair, not pictured. In order to improve their appearance I'm planning to paint them black, matte black, I think. I'm also, in an uncharacteristic move, going to co-opt them to serve as dining room chairs at my house. (Uncharacteristic because its much more common for my mom's house to be on the receiving end of my extra furniture than vice versa). Hopefully next week I'll be able to post pics of the re-finished products! Oh, I'm so jealous that you own those chairs! Can't wait to see them black. The Best Architecture Since 1980?